Ten-Year Veteran	 A face that's hard to read. No longer trying to mimic the Evo. Ten-Year Veteran	 Good height off the floor, plus generous legroom when all the way back. Ten-Year Veteran	 A real seat in the third row this year, but as tight as they come. Covered in leather, but why? 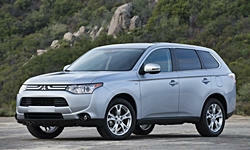 Ten-Year Veteran	 The third row in the 2007-2013 Outlander was just a piece of cloth slung over a perimeter frame. Ten-Year Veteran	 Much less cargo room behind the third row than in the 2007-2013 Outlander. The deep well is gone. Ten-Year Veteran	 Headrests must be removed to fold the seats. Decent space once you do. Ten-Year Veteran	 Flat, level load floor with both rows folded, at the expense of 9 cubic feet of cargo volume. Ten-Year Veteran	 Ultra-low rear cargo floor in the 2007-2013 Outlander. Ten-Year Veteran	 I've never come across one of these before. Ten-Year Veteran	 Too many small or obscured buttons. Splendid magnesium shift paddles are wasted in this vehicle. Ten-Year Veteran	 Dated appearance despite being all-new. Ten-Year Veteran	 Only the wheels say "GT." Ten-Year Veteran	 Also no beauty, but fewer odd details. Ten-Year Veteran	 Much more massive overhangs than the 2007-2013 Outlander. Ten-Year Veteran	 Perhaps the new Outlander's most attractive angle. Thoroughly generic. Ten-Year Veteran	 Unconvincing fake wood, dated controls, and bland styling undermine upscale ambitions. 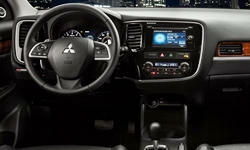 Ten-Year Veteran	 The 2007-2013 Outlander was also sportier inside. Ten-Year Veteran	 Even with a hard plastic instrument panel the Kia seems more upscale inside. Ten-Year Veteran	 Stronger than a four, but weak for a V6. Good EPA figures.